Facilities are getting more and more complicated. Systems are smaller, wireless, more decentralized, all of which make managing them a difficult challenge. Having accurate and flexible digital representations of your building(s) is a critical component to successfully managing your building’s facilities. IndoorVu is the best partner for your building and all the energy that goes into making it operate safely and efficiently. IndoorVu quickly audits existing building documentation and updates those models so that Facility Managers and their teams can be confident the data they make decisions with accurately represents the as-built condition of the building. As the products and solutions used in managing Real Estate evolve, the demand for 3D models of a building and its assets is growing. IndoorVu can create and deliver georeferenced information at a variety of level of detail and data models that accurately represent the building’s assets. Oftentimes, just basic 2D (or 3D) maps and models aren’t enough for managing complex facilities. Professionals and their software tools need to know the exact location of each asset. 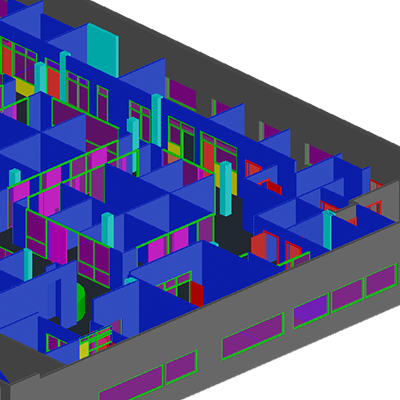 IndoorVu can extract assets inside a building as small as 4-5 centimeters and deliver their location in a variety of data models, 2D or 3D, CAD or GIS. IndoorVu delivers high definition 360 degree imagery for the entire building. Having a visual reference of the building at their fingertips gives teams the information they need to accurately and efficiently manage a building from anywhere. A high definition, georeferenced point cloud of the interior of a building is an incredibly valuable asset for a building to have. With the right tools and expertise, a huge variety of analysis and modeling can be done from the Point Cloud. IndoorVu can deliver centimeter precision for an entire building in a matter of days. This capability allows building operators to take advantage of this kind of data, where it was previously available only for more capital intensive construction projects.